bluesign technologies ag was founded in Switzerland in 2000 with the intention of providing a comprehensive production control system to limit the human health and environmental impacts of textile manufacturing. It is now 80% owned by the international testing company SGS. The bluesign standard is based on five principles of sustainability. These are: resource productivity, consumer safety, air emission, water emission and occupational health & safety. Instead of testing a manufacturer’s finished product, the applied components and processes are already audited pre-production. This so-called Input Stream Management system ensures that the use of problematic substances is avoided from the start. This results in an entirely safe finished product. The standard defines specific criteria applied to each phase within the production chain to ensure compliance with the five principles of sustainability. These criteria are based on the concept of “Best Available Technology” (BAT). Fundamentally, they require a high level of safety both for human beings and the environment as well as a sustainable production process. DyStar joined the bluesign platform as a system partner in 2008. They now have more than 600 textile dyes and pigment preparations and more than 200 textile auxiliaries listed in the blue finder database. As a result to this, manufacturers have the widest possible choice of quality products to choose from when they are seeking to produce bluesign approved fabric. Please find a list of our bluesign bluefinder listed products in eliot. 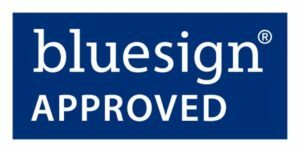 For more information on bluesign, please visit http://www.bluesign.com/. For more information on Ecology Solutions, please contact Ecology@DyStar.com.